Thaw one roll of Phyllo, following thawing instructions on package. Preheat oven to 3501/4F. Remove chicken meat from the bones and shred. In a medium bowl, mix together chicken, soup, vegetables, onion powder, black pepper and salt. Set aside. Unroll and cover Phyllo sheets with plastic wrap, then a slightly damp towel to prevent drying out. Place one sheet of Phyllo on work surface, lightly spray with cooking spray. Carefully lift two corners of a long side of Phyllo and fold in half lengthwise so the Phyllo is now 4 ½ x 14”. Spray lightly with cooking spray. 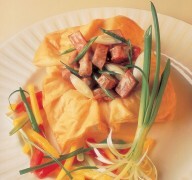 Fold in half a second time and spray with cooking spray. Fold in half a third time to now have a strip approximately 1” x 14”. Cover the strip with plastic wrap to keep from drying out . Repeat process with 15 more sheets of Phyllo. Place a piece of plastic wrap (approximately 15” x 15” on a work surface. Place 8 strips side by side vertically approximately ½” from each other. Weave the other 8 strips horizontally across them alternating over and under the vertical strips. Reroll unused Phyllo sheets and follow storing instructions on package. 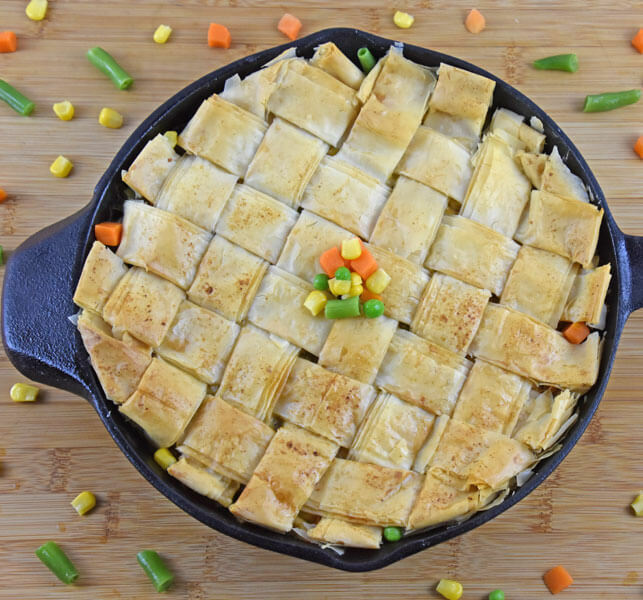 Spoon chicken filling into pie plate or cast iron skillet. Carefully flip woven strips on top of filling and remove plastic wrap. Using a thin sharp knife, gently tuck ends of dough along sides of pan. Brush with melted butter. Bake for 30-35 minutes or until golden brown. Suggested Preparation Tips: Roast the lamb and prepare the Kona Coffee Vinaigrette in advance. While the vinaigrette dressing is cooling, prepare the Mango Relish and let it chill for one hour. Finally, combine the lamb, vinaigrette dressing and other seasonings and chill for ½ hour while you prepare and bake the Phyllo shells.